A Charlotte City Council debate Monday over affordable housing revealed deep divisions, with some newly elected members saying the city isn’t doing enough for its poorest residents. Their criticism drew a sharp rebuke from Democratic Mayor Vi Lyles, whose main campaign pledge was to build affordable housing. Lyles believes the city should also build housing for people earning 60 percent of the area median income, which would be a salary of about $43,000 for a family of four. In the end, council members gave their blessing to 11 new affordable housing projects that could receive money from the Housing Trust Fund. 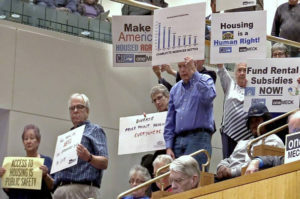 The vote and debate raised questions about a number of issues, including whether the city is doing enough for the poorest residents, whether the city is clustering subsidized housing in poor areas, and how the city will pay for housing in future years. An immediate concern is money. The 11 projects have asked for a combined $24 million money from the trust fund, which only has $6.8 million. The city believes, however, that it has enough to pay for them. The reason is that most projects must compete for state tax credits, and most won’t receive them. To bolster the fund, the city shifted nearly $2 million from a low-income housing project on Weddington Road that’s been stalled by litigation. Lyles has said the city should ask for $50 million for the fund, a large increase from the usual $15 million that voters are asked to approve in bonds every two years. Republican council member Ed Driggs said the council needs direction from City Manager Marcus Jones about whether the city will seek the $50 million bond. “The truth is, at this point we are emptying the piggy bank and we are reaching for the credit card,” he said. After the Keith Scott protests in September 2016, the city has scrambled to fulfill a council pledge to build or maintain 5,000 units of affordable housing in three years as opposed to five years. Two of the projects are likely to be built because they are applying for a less-competitive tax credit. They are the Brookshire Boulevard apartments by Laurel Street Residential and a complex on 924 W. Sugar Creek Road by Mosaic Development Group. But those projects aren’t required to have apartments set aside for people earning 30 percent of the area median income or below, which is the area of greatest need. The developers of the Brookshire Boulevard have said they would voluntarily set aside 20 of 96 apartments for the city’s poorest. Democratic council member Justin Harlow also said he was concerned there was no firm commitment for people earning 30 percent or less of the median income. Their comments drew a rebuke from Lyles, who defended city staff’s vision of helping not only the poorest residents, but those earning 80 percent of the area median income or less. Both projects were approved. But Newton, Harlow and Republican Tariq Bokhari voted against the Sugar Creek project, and Bokhari voted against the Brookshire Boulevard project. Five of the projects needed waivers from the city’s housing locational policy. That policy was designed to ensure subsidized housing was not clustered in poor areas, but council members in recent years have been usually willing to approve those waivers. None of the projects are in south Charlotte’s affluent “wedge,” where there is little subsidized housing. James Mitchell, a Democrat, said the city needs to revisit that policy. Of the proposed 950 units, 173 apartments would be for people earning 30 percent or below the area median income. That means the apartments would be reserved for people earning about $17,000 a year. That’s where the city’s biggest need for housing is. The vast majority of apartments would be for people earning 60 percent or below the area median income. Bingham Park, by Mosaic Development Group; 60 units, for elderly renters. Funding request: $775,000. Guardian Angel Villa, by Douglas Development Group; 81 units. Funding request: $1.75 million. Mineral Springs, 1734 Mineral Springs Road, by the NRP Group; 90 units. Funding request: $1.55 million. Nevin Road Apartments, 5953 Nevin Road, by Laurel Street Residential; 46 units. Funding request: $1.15 million. Nolley Court Seniors, 100 Nolley Ct., by The Housing Partnership; 103 units, for elderly renters. Funding request: $2.1 million. Northlake Seniors, 8421 W. W.T. Harris Blvd., by the NRP Group; 70 units, for elderly renters. Funding request: $1.5 million. Rivergate Greene, 13731 S. Tryon St., by the Woda Group; 72 units, for elderly renters. Funding request: $1.9 million. Sugar Creek Greene, 6130 Bisaner St., by the Woda Group; 72 units. Funding request: $1.84 million. The Park Seniors, 5915 Beatties Ford Rd., by Laurel Street Residential; 80 units, for elderly renters. Funding request: $1.8 million. 924 W. Sugar Creek, 924 W. Sugar Creek, by Mosaic Development Group/Crosland Southeast; 180 units. Funding request: $5.3 million. Brookshire Boulevard Apartments, 7326 Bellhaven Blvd., by Laurel Street Residential; 96 units. Funding request: $4.2 million.